The YA (Young Adult) / Teen genre has had its ups and downs in some of its book adaptation franchises. Barring the more teen fictional romance “page to screen” endeavors (i.e. The Fault in Our Stars, Paper Towns, Love, Simon, and few others), which more of a “one and done” projects, the YA / Teen genre of films has focused on the more fantastical side of storytelling, weaving in elements of fantasy, sci-fi, and paranormal to entice moviegoers into watch the film and supplanting the idea for a potential franchise tag on these adaptations. While some have cultivated in both movie and pop culture success like the eight-part Harry Potter films series, the four-part Hunger Games films, and the four-part Twilight series, some films failed to spark popular cinematic praise for the “book to film” adaptations. Movies like Ergaon, The Mortal Instrument: City of Bones, Beautiful Creatures, The 5th Wave, The Golden Compass, and I am Number Four were widely considered “bad movies” and failed to connect with its viewers (or even its source material) and were halted after their initial installment was released, scrapping their cinematic sequels and abandoning their potential franchise tag. Even more so, some franchise, despite having an overwhelming bestselling success in its literary format, have either failed to find a steady medium with moviegoers, with movie franchises like The Chronicles of Narnia series, the Percy Jackson series, and The Divergent Series were all able to produce two or three installments, but failed to connect with audiences, which lead their potential follow-up sequel to be cancelled in the process. Now, in the latest endeavor of the YA / Teen book adaptation realm, 20th Century Fox and director Jennifer Yuh Nelson, present the film The Darkest Minds, based on the first book Alexandra Bracken’s teen novel series. Does this theatrical representation of Bracken’s 2012 book rise to the challenge of cinematic potential or does fall into obscurity with the rest of the “one and done” YA / Teen films of the past? A sudden and mysterious plague has worked its ways across the United States, killing mostly every child in the nation. Those spared are newly endowed with special powers, with the color of the eyes helping to identify skills and levels of danger (i.e. green is super intelligent, blue is kinetic psychic powers, yellow is electricity, orange is mind control, and red is fire). One of these individuals is Ruby Daly (Amandla Stenberg), who has been stuck in a government prison camp for six years as the nation fears of what may become of these special “powered” children. In sudden turn of fate, Ruby is offered help to escape her imprisonment from Dr. Cate Connor (Mandy Moore), a government agent who works secretly with The Children’s League, an underground organization trying to help the plague survivors and rise up against the tyrannical rule of the government, led by President Gray (Bradley Whitford). Unable to trust Cate or her associate Rob Meadows’s (Mark O’Brien) true intentions, Ruby flees and runs across other children with “abilities”, finding companionship from Liam Stewart (Harris Dickinson), a blue, Chubs (Skylan Brooks), a green, and Suzume “Zu” (Miya Cech), a yellow. Together, this quartet of fellow outlaws make their, avoiding bounty hunters and discovering more about themselves (with Ruby trying to make peace with her reality), while the group seeks to find the “slip kid”, a messianic figure who runs a safe haven for the kids with abilities and away from the villainous fearmongering rule the government. Being a longtime employee at a bookstore, I’ve naturally read a lot of book from various literary genres. However, I do gravitate more towards the YA / Teen section of books. Why? Well, for a lot of reason, but mostly because there usually more like “causal reading”, which means nothing super hard and dense like reading Ken Follet’s Century Trilogy or George R.R. Martin’s A Song of Ice & Fire series. Also, there usually a large collection of them, with plenty of new releases being published every month. So…I sort of get my fill of them. Plus, a lot of customers ask the age-old question: “My son / daughter, niece / nephew, grandson / granddaughter, friend’s kid read Harry Potter or The Hunger Games…. what do you recommend?”. As for the “movie side of me”, I read a lot of these books that were adapted into feature films, with the hinting notion of making these popular novel series into motion picture franchises. As stated above, this road to getting these done can be quite challenging and definitely has been a bump road. Of course, the Harry Potter movies are the perfect example of rousing success in translating the written world of Rowling’s Wizard World into a cinematic powerhouse adventure series. That same can be said with the Twilight Saga (for better or worse), The Hunger Games series, and The Maze Runner series, which were able to tell the literary story and onto the filmmaking screen in its entirety (from start to finish). However, a lot of other “page to screen” adaptations of the YA / Teen genre have had mixed results, with some personal favorite novels failing underweight the of a cinematic adaptation (i.e. The Golden Compass, Eragon, and Percy Jackson: The Lightning Thief), with most flopping at the box office due to just being “poorly” made and tonally wrong to what its literary source material. Thus, you can imagine my surprise (and almost a bit of worry) when I movie studio announce a popular YA / Teen novel series (first installment) to be made into a movie. This, of course, brings me back around to talk about The Darkest Minds, the latest Hollywood endeavor in bringing a well-known Teen fantasy / adventure novel to the big screen. For those who don’t know, The Darkest Minds was written by author Alexandra Bracken and is the first installment in The Darkest Minds novel series (with five books released as of 2018). Working in a bookstore, I came across this novel from time to time as the name of it kind of attracted me (I kind of like the title). Still, it wasn’t enough for me to pick up the book and read it, which (after seeing the movie) I might finally do so. Thus, as a side-note, my review for The Darkest Minds is gonna be primarily on the film itself and not so much on the comparison to what Bracken’s novel (i.e. what was add, subtracted, or changed from page to screen). Beyond the books, I really didn’t hear much “buzz” about this movie on the internet or with anyone really…. that was until I saw the film’s trailer. While I can’t exactly remember when the theatrical trailer debuted online (I didn’t even post it on my blog…sorry about that), but I did remember seeing it (for the first time) when I went to see Avengers: Infinity War. To be honest, at first glance I thought it was a new X-Men movie (i.e. kids with powers and the like), but it turns out that it’s completely different from that cinematic universe). Still, while I kind of had a vague notion of that, the movie trailer for The Darkest Minds kind of intrigued me to see the film. Plus, I liked the song that played throughout the trailer, which was “Revolution” by Unsecret ft. Ruelle and that I immediately downloaded on iTunes. Since the conclusion of Maze Runner series with The Death Cure in January 2018, the epic YA / Teen adaptation film sagas have all but gone dormant t until this movie. So, I was kind of interested to see if this movie could “rejuvenate” today’s moviegoing public into the uprising of courageous youths. Thus, I went to see The Darkest Minds, with that gleaming hope in my high. When I came out, however, the gleam faded into a faded and dull glow. 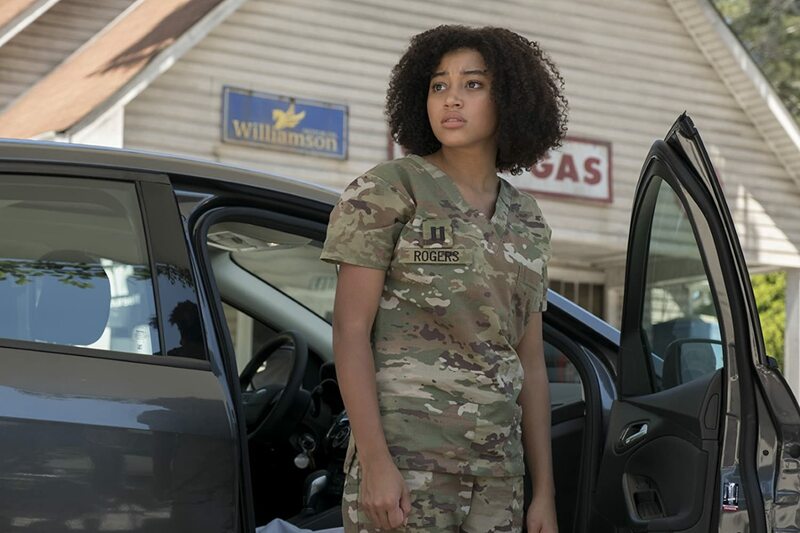 While not entirely terrible, The Darkest Minds is sadly not the movie it desperately wants to be, with a hodgepodge of ideas that don’t work correctly in making the film entertaining enough for us (the viewers) to care about. In short, the potential is there, but squanders it all in a very haphazard way. The Darkest Minds is directed by Jennifer Yuh Nelson, whose previous works include working animated endeavors for DreamWorks with movies like Kung Fu Panda 2 and 3. Given the success of the Kung Fu Panda franchise (especially with Nelson’s work on the latter films), Nelson seems like a suitable choice in bringing Bracken’s first installment to the big-screen, marking The Darkest Minds her biggest (and most ambitious) directorial film to date. To that effect, Nelsen makes her “largest” project semi-work, orchestrating (and juggling) a lot of ideas of storytelling, characters, and ideas into making a cohesive feature length film. Naturally, given Bracken’s source material, Nelsen does play upon the common tropes of recent YA / Teen endeavors, which is sort of like a “double edge sword” type of thing (more on the negative point below). As for the positive ones, it brings a sense of familiarity that of which many will find to their liking from recent features, including stories of courageous young people, an oppressive government, and some hints of “young love” romance. It all works and does play out in a entertainment manner. Additionally, while I can’t speak of Bracken source material, the narrative told in The Darkest Minds touches upon a lot of suggestive and very human themes to tackle and to overcome, including identity, acceptance, sacrifice, redemption, forgiveness and several others. Thus, the underling themes and message throughout the film are commendable, especially given within the context of YA / teen mantra as well as the viewing of the youths of the world. Speaking of which…. the current youths of today (teens mostly) might find attraction to this story (whether they read the book or not), especially given to the recent events of youths becoming more “vocal” and “standing up” for their rights against what adults / society order of the nation’s government. Of course, there’s a lot of similarities and discussion topics between the two (i.e. reality bleeding into fantasy), which is always a good idea to weave into a fictional tale. Thus, the thematic message in The Darkest Minds is one that should not overlooked, seeing its reflection being slightly mirrored and (possibly) empower more teenage young adults to stand up for their rights. Still, there is a sense of engaging notion for large portion of the film, which did keep me mostly invested in the film’s journey, following the adventure Ruby and company on their adventures in this “brave new world” sort of vibe in the film. In terms of presentation, The Darkest Minds is a solid endeavor in bringing Bracken’s literary story to life on the silver screen. Given this dystopian setting is more of a present one (i.e. in the not too distant future) and not set in a more future sci-fi one, the movie’s production budget doesn’t need for some fantastic / elaborate set-pieces or super saturated CGI visual effects in order to bring this world to a cinematic world. Still, the quality of the film’s production is still a good one as it really breaks even. What do I mean. Well, it’s not really incredible awesome nor is it downright deplorable. It’s somewhere in the middle (right where it belongs) and that’s really not a bad thing. Thus, much of the contributing “behind the scenes”, including production design by Russell Barnes, set decorations by Frank Galline, cinematography by Kramer Morgenthau, and film editing by Maryann Brandon and Dean Zimmerman give generally favorable in making the film look good. Again, most of these areas won’t be nominated for any awards during this upcoming award season, but their efforts to do make The Darkest Minds still pleasing to the eye. As a side-note, the film’s s musical score, which was composed by Benjamin Wallfisch is actually pretty good, delivering the right amount of bombastic flourishes and soft melodies whenever called upon throughout the feature. 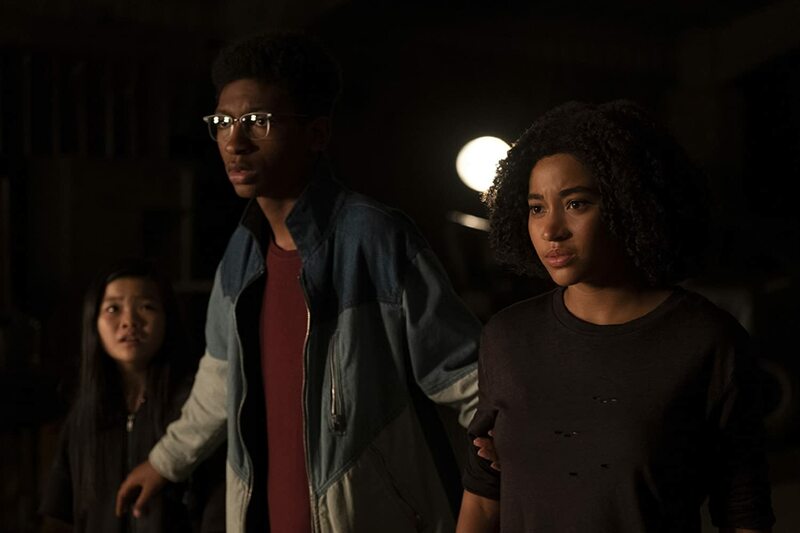 Problems do quickly rise up in The Darkest Minds, which cripple the movie and hinder it from become a truly standout feature in both the YA / Teen subgenre of movies and in it’s the world of moviemaking. Perhaps the most notable one is the fact that the film is too derivate to what’s already been done. While Bracken’s books might be celebrated and bestselling amongst readers, the movie just doesn’t really do much in the way of innovation or creativity of which that’s already been done (cinematically speaking) before. 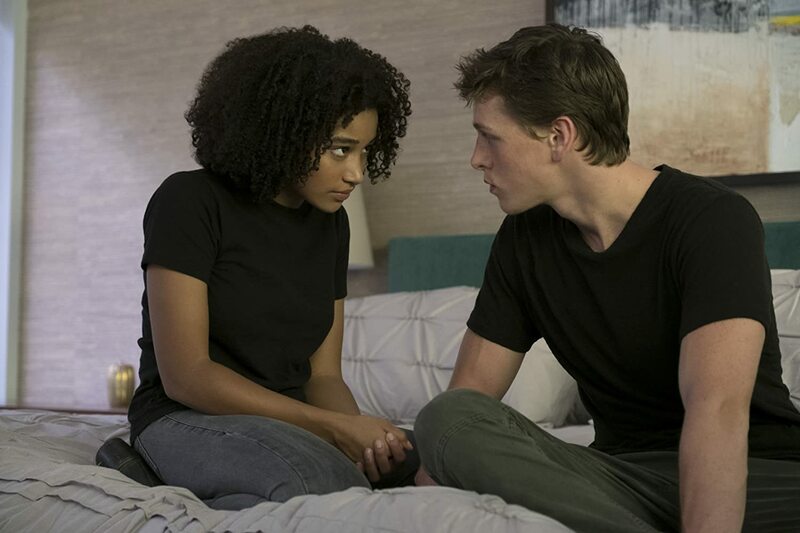 While I mentioned above the film has a sense of “dystopian familiarity” that many will like, The Darkest Minds feels to derivate and commonly overused ideas that other teen dystopian features have used. There’s a little Hunger Games, there’s a little Divergent, there’s a little Maze Runner, and there’s a little The 5th Wave all in the movie. However, while familiarity goes hand-and-hand with creating more and more films within a genre, the ideas need to be more fluent and stand on their own merits. In the case of The Darkest Minds, the movie just feels like a cobblestone version of all those movies. Thus, the screenplay, which was adapted and penned by Chad Hodge, is utterly derivate, boring, and lazy. Again, I can’t speak for Bracken’s novel, but Hodge’s script has been done before, including kids with powers, a surprise twist villain, a big showdown, and even a feign love interest. Because of this, no matter how much the story is engaging (depending on your level of getting engrossed in the film’s plot), the movie never lives up to its own potential nor its own foundation to stand on. Thus, the movie lacks substance and imagination. 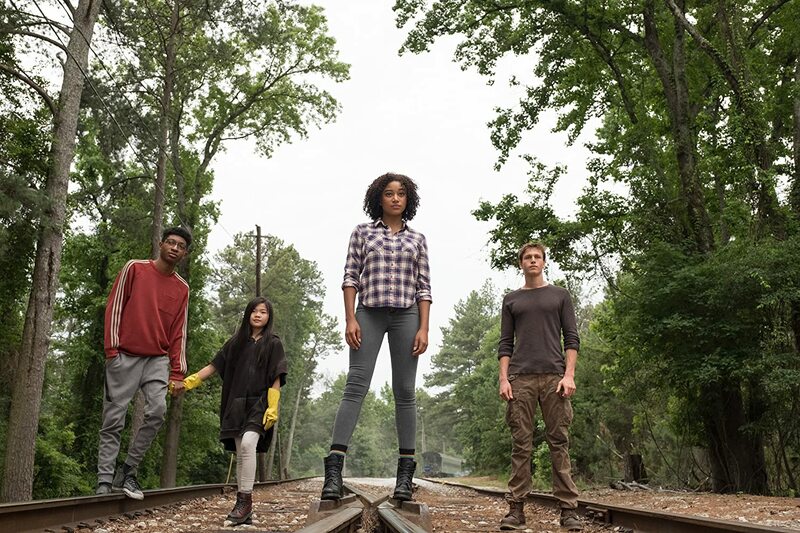 Even if you discarded the YA / Teen element from The Darkest Minds, the narrative plot / story follows a group of kids with powers from government officials. Sounds like a whole lot like a X-Men movie, with individuals with powers (i.e. mutants) must come together to stop an on-coming threat and find their place in the world. Again, this idea isn’t something new, but it needs to be crafted (and molded) into a way that makes it fresh, which Nelsen fails to capture in the movie. In short, The Darkest Minds, despite its pros, is more of a generic cliché of its own genre than anything memorable or unique to stand out amongst the crowd. In conjunction with that idea, the movie’s pacing is all over the place, creating several areas which are problematic as well as hamper the film’s narrative. With a lot of setup (to the plot) and in world-building, Hodge and Nelsen have a lot “ground” to cover in bringing Bracken’s novel to the big-screen. However, the movie, which has a runtime of 105 minutes (i.e. one hour and forty-five minutes), feels overlong and bites off more than it can chew by trying hard to explain how the current world was so suddenly transformed in such a short time. Because of this, the justification on how things happen in the movie (backstory and world-building) chews up a great deal of time and (what makes it worse) that it sort of vague in doing so. The mysterious plague that affected the kids? The shady turns of the government? The Children’s League? The Slip Kid? The mystery behind the “red eyed” kids? A lot of these are laid out in the movie, but neither Nelsen nor Hodge take enough time to fully “reveal” a lot of these plot-points, with most being glossed over. This, of course, adds a lot “mystery” to the overall narrative arc of the feature, which is “supposedly” to be further explain in the possible future installments. Unfortunately, unless the movie has already been proven to sell (like Star Wars or Harry Potter), creating a movie franchise is hard thing to sell nowadays, especially when the “franchise tag” isn’t really guaranteed. Thus (and I have a feeling) that The Darkest Minds is gonna be a “one and done” type of movie endeavors, which renders a lot of the unfinished / unresolved mystery and further continuation that it presents in a rather limbo stance. Still…. back to talking about the pacing issue. While the movie tries to juggle a lot of the story / world-building in the movie, the pacing becomes to top-heavy in various parts (with most of it being too unbalanced in its exposition understanding) and creates an uneven throughout. This also extends to a sudden twist that occurs during the third act. Its not really a fully surprise (and bit predictable in the narrative flow) and doesn’t really feel like a warranted twist (at least in the way in how its presented). Adding to that is the climatic showdown during this act, which is very lackadaisical and not at all at what I was expecting (i.e. I was expecting a bit more epic and longer). However, all that pale in comparison to the last fifteen minutes of the movie in which The Darkest Minds slows to a crawl. Basically, without spoiling it, the movie peaked its climax too quickly and the resolution part of the film seems to drag and go on and on and on, without every feeling enjoyable. Yes, I know that sounds ridiculous as the movie is trying to bringing the narrative to a stopping point, but it becomes too painfully boring and could’ve been easily told in half of the time allotted. Thus, the pacing towards the ending is terrible. 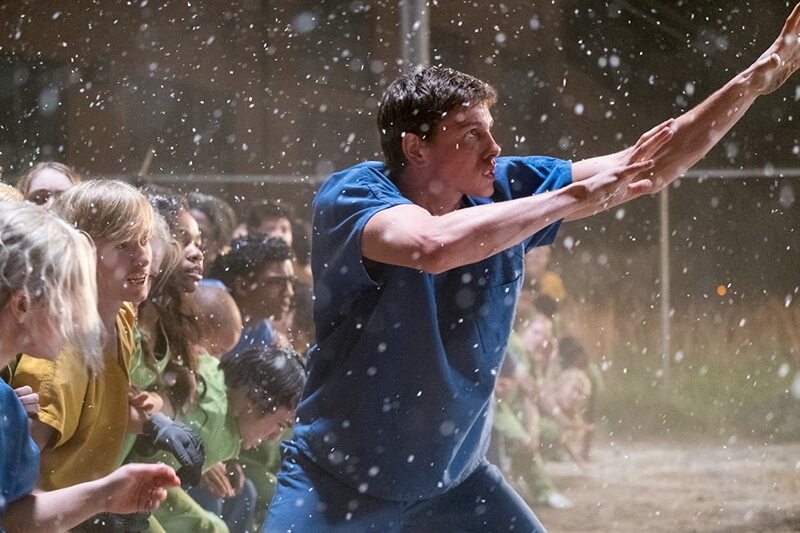 All in all, The Darkest Minds has all the right components to be great, but lacks guidance and a certain finesse throughout, which weakens the movie and turns it bland and generic. The cast in The Darkest Minds is primarily made up of a younger cast, with a few adult actors / actresses in more supporting roles. Thankfully, the younger cast members are to up to the task (most of them) to elevate the movie beyond its weaknesses. At the head of the pack (and leading the charge) is actress Amandla Stenberg, who plays the film’s central protagonist character Ruby Daly. Stenberg, known for her roles in The Hunger Games, Everything, Everything, and The Hate U Give, does provide a good and solid performance as Ruby. She handles herself with some of more heavy-handed (dramatic) dialogue scenes and makes us feel that Ruby is not really a “hero” like character (from the get-go), but rather a teenager girl who must comes to terms with her newfound powers as well as surviving this new world order (i.e. who to trust). So, while she isn’t exactly a Katniss Everdeen-esque character (not yet in the narrative thread), but Stenberg’s performance elevates the character to make Ruby endearing and memorable in the movie. Behind her is actor Harris Dickinson, who plays the character of Liam Stewart, one of the “surviving” kids (a blue) who has the power of telekinesis. Dickinson, known for his roles in Trust, Beach Rats, and Clique, does a pretty good job as Liam. He has that screen presence, which makes him standout from much of the rest of the cast (which is a good thing). The chemistry between Stenberg and Dickinson is pretty and a believable one, which does help the characters of Ruby and Liam (in their more romantic scene moments). Although, while their on-screen chemistry works (for the most part), the whole YA / teen romance seems a bit much, especially within the context of certain events and just becomes a bit “blah”; most noticeable during the film’s ending piece. The rest of the younger cast, including actor Skylan Brooks (Southpaw and The Get Down) as intellect Chubs (a green) and actress Miya Cech (American Horror Story and American Housewife) as quiet Zu (a yellow), and actor Patrick Gibson (What Richard Did and The OA) as President Gray’s son Clancy Gray, are in more supporting roles and (mostly) give good performances in their respective roles. The only adult actor that makes a lasting impression in the movie is actress Mandy Moore (A Walk to Remember and Tangled) as Dr. Cate Connors. Moore’s screen presence is good in the movie and there’s really nothing wrong with her acting abilities. Her character, however, is a bit underdeveloped as there’s really not much to her…as if the movie is holding back on her character’s depth for future installments. Still, Moore’s Cate is probably the strongest adult cast member of the bunch. The rest of the adult cast members of the film are mostly in small supporting roles, including actor Mark O’Brien (Arrival and Halt and Catch Fire) as Dr. Cate Connor’s colleague / associate Rob Meadows, actor Wade Williams (Prison Break and Draft Day) as the Captain (a commander solider in charge of one of the prison camps. I know he had a character name, but I can’t remember it), actress Gwendoline Christie (Game of Thrones and Star Wars: The Last Jedi) as bounty hunter assassin Lady June, actor Bradley Whitford (Get Out and The West Wing) as President Gray, and actress Golden Brooks (Girlfriends and Beauty Shop) and actor Sammi Rotibi (Batman v Superman: Dawn of Justice and Tears of the Sun) as Ruby parents Molly and Paul Daly. Some are fine in their respective roles, but others could’ve been easily developed beyond the “skin surface” that was afforded to them. The acting talents by these actors / actresses are not in question, but rather their character developments are stock-like and woefully undeveloped. 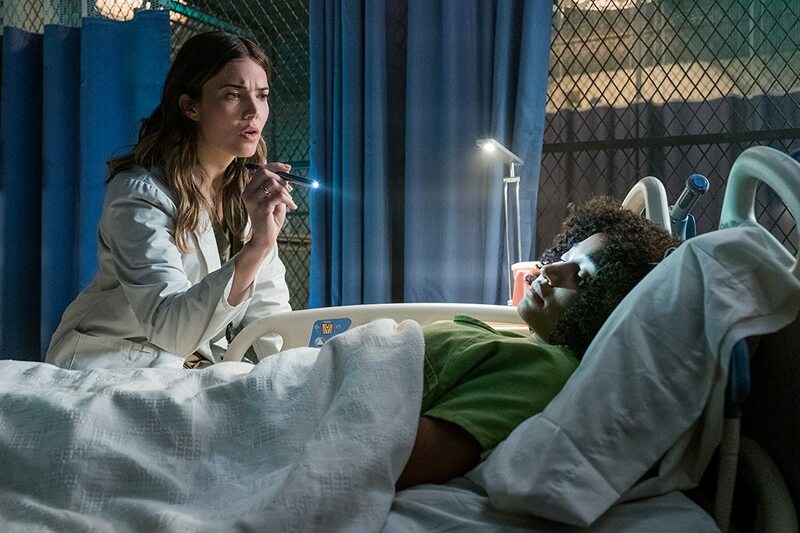 Ruby Daly, along with fellow kids Liam, Chubs, and Zu, must band together, learning to trust one another, and find the elusive “slip kid” haven for the “kids with power” in the movie The Darkest Minds. Director Jennifer Yuh Nelson’s latest film finds the adaptation of Alexandra Bracken’s bestselling novel to the silver screen, telling the first tale of Ruby Daly saga and discovering her place in the nation’s society of adult humans and those endowed “individuals” kids / children like her. While the movie talks about some powerful themes (friendship, love, identity, and acceptance) as well as mirroring the idea of youths “standing up for their rights” in society and several of the film’s younger cast giving some solid performances, the film can’t escape from being blandly derivate to past “page to screen” endeavors, clunky in its script undertaking, blocky in its film’s execution, sluggish in its pacing, just properly well-handled as a feature film. To me, the movie was kind of “meh” and a bit bland. He had some elements / pieces that I did like, but majority of the feature was a lot of “been there, done that” and really didn’t add much than to what’s already been said (and done) in several more prominent YA / teen movies out there. Thus, my recommendation for this movie is simply a “skip it” as the movie really doesn’t offer much beyond a few pieces here and there. Just watch the other franchise (The Hunger Games, Maze Runner, or even Divergent) out there and you’ll get more about of them than this movie. Perhaps maybe the genre is dying out and moviegoers have moved away from watching (and liking) YA / teen adapted “books to film” movies. It’s possible. Regardless, its seems very unlikely that we (the viewers) will see Bracken’s second novel “Never Fade” receive a cinematic treatment as The Darkest Minds seems very much likely a “one and done” YA / Teen endeavor, sealing the fate for this potential film franchise to ever materialize.